Cheap thrills for discerning rockers. Ballsy performance. Impressive spec for the money. Some players may prefer a neck humbucker. Derivative design. If you've salivated over top-shelf ESP electrics but find your wallet sadly lacking when it comes to making a purchase, we'd urge you to check out the LTD range, launched in 1996 to put ESP styling and performance within the reach of the erm, more financially challenged guitarist. The MH-103QM is near the bottom rung of a range that spans from £269 to £999, but all things considered, it's certainly well-appointed. ESP-branded pickups and tuners, a double locking Floyd Rose-style vibrato and a quilted maple top - almost certainly a veneer - all feature, along with recessed controls. Basswood may not be the sexiest timber, and the thru-necks of the pricier MHs are absent, but this still represents a bargain on paper. Okay so the body outline might be derivative, but we love the vibe of the MH-103QM. It's functional, comfortable, aggressive without scaring off non-metallers, well-appointed without coming on like an eighties superstrat and nicely built by LTD's Chinese production line - albeit with untidy solder wire in the pickup cavities. The MH-103QM has neither the look nor the performance of an entry-level electric. 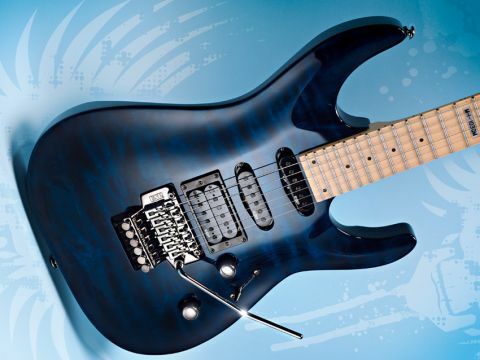 The slick two-octave fretboard and the U-shaped neck profile make this a fast and satisfying performer. The jagged headstock and floating vibrato imply shred, but this baby has soul too, responding well to weeping blues licks and sliding barre chords. Some would prefer the active EMGs of the ESP range, but we welcome the versatility of the MH's configuration. The bridge unit is tailor-made for scything through a rhythm section, and the middle single-coil offers a clipped, funky tone with shades of a good Strat copy. Our only issue is that we'd prefer the tonal weight of a second humbucker in the neck. But let's not dwell on that. Practice hard enough and this could be your ticket from the bedroom to the O2 Arena.